It’s tough running an independent bookstore. To make such a business successful it helps having God on your side. 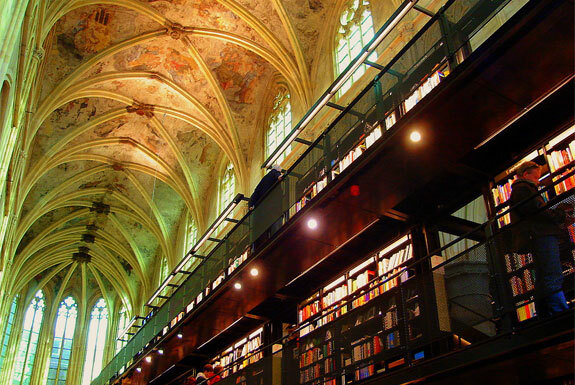 Perhaps that’s what the proprietors of the Selexyz Dominicanen Bookstore were thinking when they decided to house their establishment in a 13th century Dominican cathedral in the center of Maastricht, Holland. Though, in truth, the cathedral hasn’t been a center for worship since Napoleon put the kibosh on services after he invaded Maastricht in 1794. Since then the cathedral has been alternately abandoned, used as a warehouse and turned into what was probably the world’s most sanctified indoor bicycle parking lot. 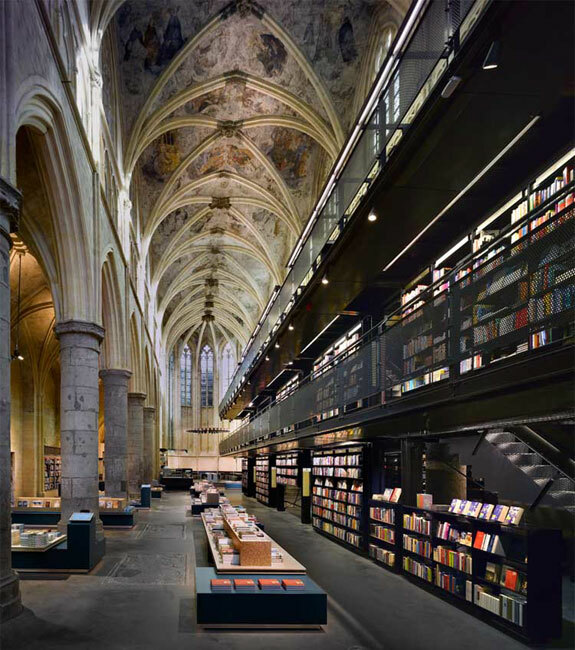 Despite the fact that the cathedral hadn’t been a working cathedral for more than 200 years, turning the space into a bookstore was an enormous challenge for Selexyz Dominicanen’s architects. A city ordinance required that the cathedral be completely preserved, meaning that no permanent modifications to the building of any sort were allowed! 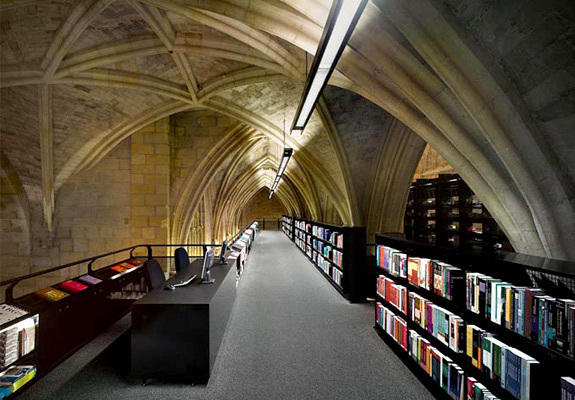 So how do you create a three-story bookstore in a cathedral when you can’t drill any holes into the building or attach anything load-bearing to its walls? Selexyz Dominicanen made ingenious use of free-standing black steel scaffolding. This scaffolding completely supports all the bookshelves and the catwalks to them. The shelves and scaffolding are close to the cathedral’s walls but scaffolding never actually touch them. 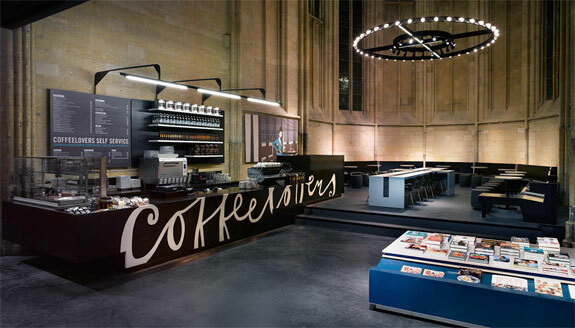 Add to that a tasteful use of religious iconography (check out the cross-shaped reading table in the pic, above), a nice cafe located where the church choir once sang, and a slew of inviting nooks and comfy reading areas and the result is a bookstore that’s absolutely divine. 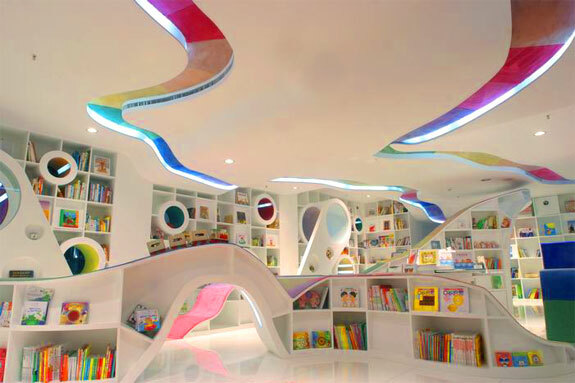 What a cool design concept: Start with an all white bookstore interior—white floors, white ceiling, white walls, white stairs, white bookshelves, white everything—and to that liberally add rainbow splashes of bright color. 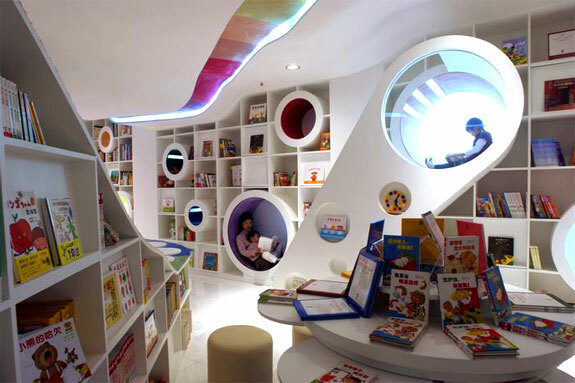 Stock your shelves with a huge multi-language selection of kid’s books, add reading cubbyholes and padded activity areas, and you have Beijing’s Poplar Kid’s Republic, our favorite children’s bookstore in the world. (Sadly, our previous favorite children’s bookstore, the Cheshire Cat outside of Washington, DC, closed down several years ago—we hope endowing our current favored status upon the Kid’s Republic won’t condemn it to the same fate). Our few photos below don’t really do this huge store justice so check it out yourself next you are in Beijing. Kid’s Republic also has a branch, nearly as cool, in Shanghai. Think a profitable store can’t be lush, rich and somehow homely? 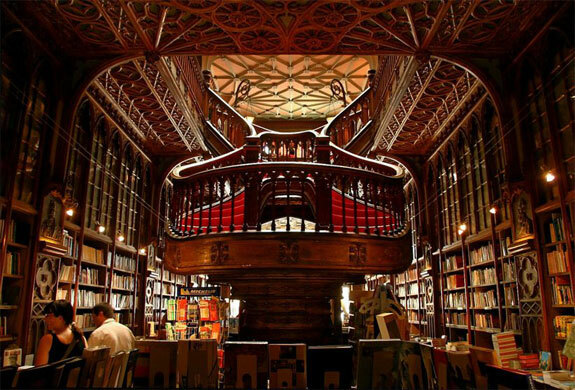 The velvety Livraria Lello in downtown Porto will change your mind. Not so much the art nouveau exterior as the gold-accented interior with its red carpets, stained glass, wood paneling and flowing central stair case. Walking into this bookstore, we had an insatiable urge to light a cigar (and we don’t smoke) because, well, this is the sort of place it seems like one should do that. And, indeed, this is the sort of place where one can do that. Cigars are sold in the Livraria Lello’s upstairs four-table coffee shop along with port, coffee (obviously) and baked goods. Quiz question: Where and when was the first ever movie with sound shown to a public audience? Of course, this gorgeous building in central Buenos Aires wasn’t always a bookstore. It started its life in 1919 as the Teatro Grand Splendid; more than 1,000 patrons would fill the theater to watch operas and tango performances. 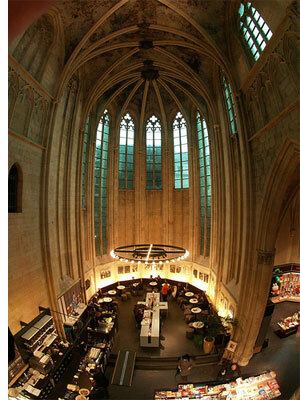 In 1928 this space was converted into a cinema. It has been a bookstore since 2000. Happily, the El Ateneo architects included many homages to the building’s theater days including curtains and stage lighting. 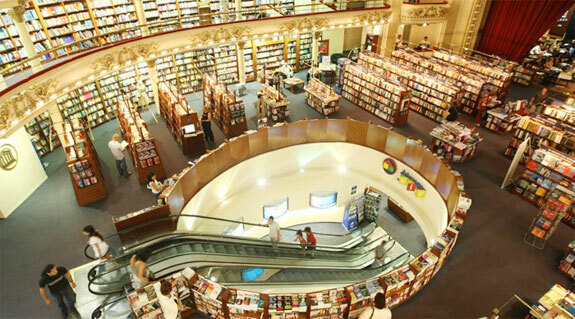 There’s also a wonderful cafe up on the “stage.” Add to that plush seating areas and a huge selection of literature and you have what is by far the best bookstore in South America, arguably the most luxurious in the world, and #4 on coolest-looking bookstore list. If you’ve seen the movie Before Sunset you’ve seen the inside of the Shakespeare & Co. Antiquarian bookstore—this is where Julie Delpy’s character reunited with Ethan Hawke’s during a book signing. If you’ve read Time Was Soft There: A Paris Sojourn at Shakespeare & Co. (and if you haven’t you should) then you are intimately familiar with this bookstore. 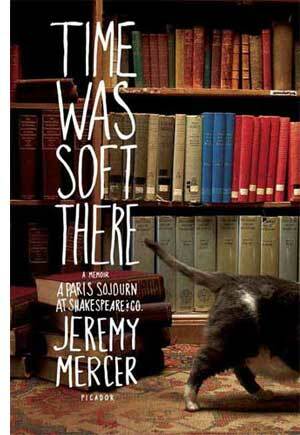 Time Was Soft There is the lusciously-written memoir of a homeless man who was allowed to sleep overnight in Shakespeare & Co by the store’s communist-leaning owner and then refused to vacate when times turned more capitalist. His bed is still there (see pic, below). But even if you’ve never seen the Shakespeare & Co. Antiquarian bookstore in the movies, or read about it in books, you’ll step through the store’s doorway and sense that this is the sort of quaint, quirky place that should be in cinema and literature. The isles are piled with books. The writer’s room has a working piano for patrons to play. Poets regularly read their work in one of the back rooms. And if you can’t get to Paris personally then at least visit the store’s supremely well done website—poking around it is almost as much fun as poking around the store itself. Originally this post was envisioned as a list of five bookstores. We had to expand it to six in order to squeeze in Polanco branch of El Péndulo. This bookstore isn’t as amazingly stunning or history-filled as the above five selections are. But it is bright, spacious, huge and gloriously plant-filled. Plus the store (and attached cafe) isn’t shy about using air conditioning, which makes El Péndulo a wonderful literary escape on a hot Mexican day. Shakespeare & Co. tops my list. Book Buyers in Charlotte,NC, is our secret treasure. If you’re in Columbus, make it to Acorn Books or Karen Wycliffe’s. These two smaller used bookstores are really wonderful and provide cool old rarities on the cheap. Also, it’s weird that Chicago’s Hyde Park neighborhood didn’t get any love. Lots of cool used bookstores there! With Amazon slowly taking over the publishing world and bookstores closing left and right, things can sometimes seem a little grim for the brick and mortar booksellers of the world. After all, why would anyone leave the comfort of their couch to buy a book when with just a click of a button, they could have it delivered to their door? Can’t imagine a bookstore can be so massive and huge. Wish I could read them all. I totally agree, Fida. Anytime I’m browsing a bookstore, I get lost in the atmosphere. You’re surrounded by so much knowledge at once. It’s kind of empowering. 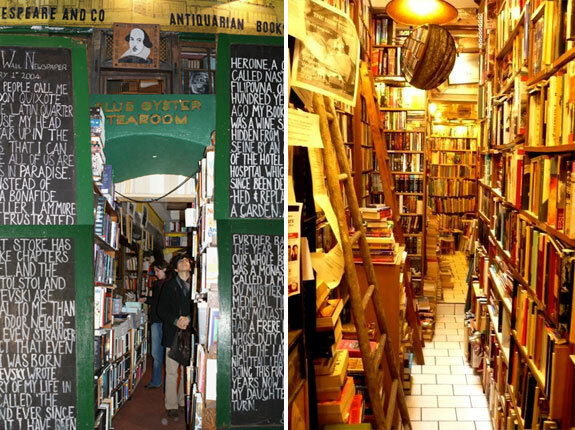 Some of these bookstores seem so amazing, I would probably never leave once I entered. Anytime I’m browsing a bookstore, I get lost in the atmosphere. You’re surrounded by so much knowledge at once. It’s kind of empowering. 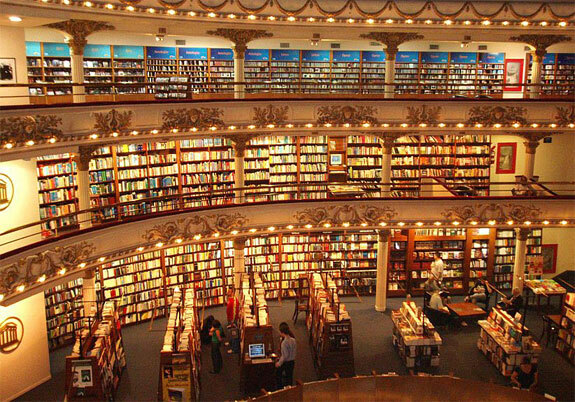 Some of these bookstores seem so amazing, I would probably never leave once I entered. Perhaps not the most beautiful bookstore but one of the most interesting in terms of engaging people in literary events is Book Passage in Corte Madera. They also have a location in San Francisco in the Ferry building. There are classes and author book signings and lectures almost every day. I wish I lived there just because of Book Passage. Remarkable! Some of them remind me of the Harry Potter movie, great post! One boookstore that did not make the list (and this list is quite impressive) is Barts Books in Ojai, CA. It the worlds largest outdoor bookstore. A really fun place to visit where you can enjoy the open air and sit under a market umbrella to have a read. Or you can wind thru its labyrinth of bookshelves & aisles and discover something new. I totally concur. Acqua Alta is one of the most delightful bookstores I’ve ever been to. The owner is quite a character as well. 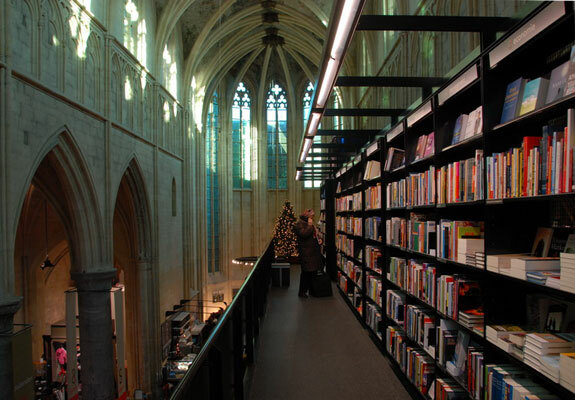 Ah man, the Dutch seriously know how to create great bookshops and libraries. Even simpler, just look at the awesome library at the Schiphol airport in Amsterdam. Beats wasting time in the airport lounge! hi! another great book store, acoording to the owner ¨the most beatiful bookstore in the world¨and i think he is right, its in venezia, (i cant give wxactly the address , i guess you will have to get lucky to find it. but it even has a gondola inside!!!! 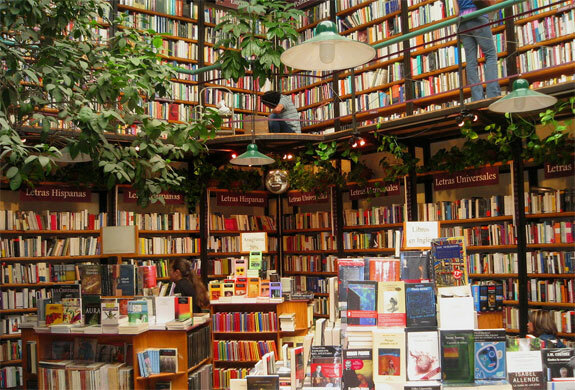 Gotta agree with @Paris?…I made a special point of seeking out Shakespeare & Co when I was in Paris this June, because of Hemingway’s _A Movable Feast_. Cool atmosphere, but as a bookstore, it kind of sucked. Poorly organized, cramped, used books outrageously overpriced. It didn’t make me want to linger. Powell’s in Portland is 10x better. umm, i would totally love to travel and see all of these!!! ahh-mazing!! 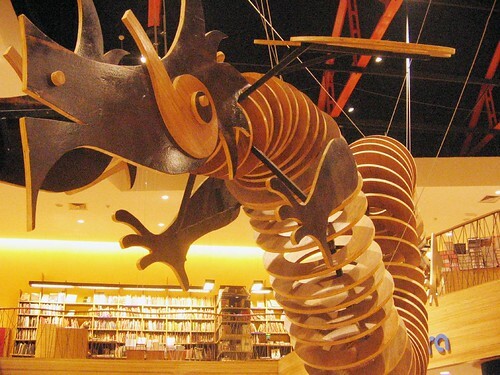 Wow, this article made me want to travel and visit the bookstores featured! Who says bookstore cannot be beautiful? the one in Porto, Prtugal looks like the bookstore that was in Harry Potter – when they had the blonde hair, hollywood-looking professors who turned out to be a fraud. a scene in the beginning of the movie (which introduced that same actor) was filmed in a bookstore that looks just like Livraria Lello. I personally love Shakespeare & Co, and still refer to it – after discovering it many years ago – as one of my favourite places on earth. If you want a sterile, spacious bookstore with a searchable database, then go to one of the many chains around the world. If you want a place that oozes stories from every pore, and not just from the books, then it’s the place to go. It’s not about finding something you’re looking for, it’s about finding something you’re not looking for. I personally love bookshops where I can duck into nooks, browse around and find all sorts of gems in hidden corners, rather than standing in front of an alphabetised wall of books with 2-for-1 stickers on them. In my opinion Shakespeare & cie is entirely over-rated. Sorry…it has a great history, but it is an institution, not a good bookstore, and the interior is cramped and dank and dirty/smelly. Sorry to be such a crank, just calling it as i smell it. Very nice to look at… unless your a tree. Wow~ I am in awe. 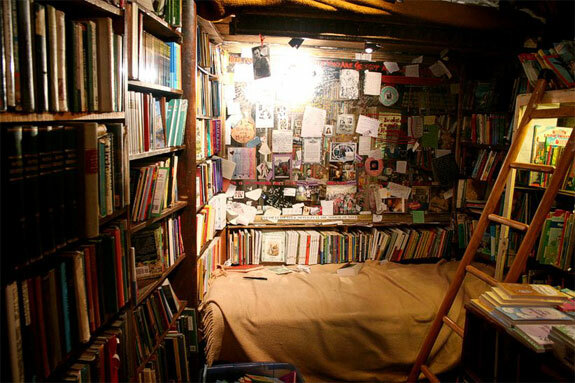 It would be inspiring to look for books in any of those environments. What an unexpected and refreshing post to stumble upon. Thank you. the one thing i regret about my trip to paris is not going to shakespeare and company. ate at a cafe next door, thought “i should take a look in there,” and never did. To the person who said John King’s in Detroit deserves to be on this list–I agree wholeheartedly. Wonderful, wonderful place. The building may not be -pretty- in the common sense of the world, but the signs that it was once a factory are still very clear–and even if it was another sort of factory that became Detroit’s claim to fame and, ultimately, its downfall (at least for now), there’s something to putting a bookstore in a building that was part of the industrialism that made Detroit what it was. Wonderful, wonderful store. Have been there many times. However, I want to say–great list. I know I’m unlikely to ever get to visit many of them, but I enjoy getting to look at the pictures and read about them. have you not been to bloom and curll in bristol? It’s funny that Selexyz Dominicanen made #1 on the bookstore list and it would be lucky to make #100 on the library list. I’m looking forward to your library review!!! The El Péndulo book store look so lovely and bright. Thanks for the pic links, Lady Dandelion. So you know, we’ve been working on a review of cool looking libraries. Keep on eye out for that . . . The Kid’s Republic Bookstore in Beijing is really quite terrible. A bad selection of books (i.e. not much variety or quantity), and the colorful carpets you see are quite dirty. YES! Powell’s is one of my favorite places in the WORLD. I actually read this list to see if Powell’s made it…. but sadly, it did not. i tihnk there is one that you should add. its nothing special in terms of architecture, but its one of the biggest bookstores i know of. its called powell’s city of book in portland, oregon and takes up more than a full city block, 2-3 stories tall. its massive, and there has never been a book that i couldn’t fine there. I think that John K. King Books in downtown Detroit should be added to this list. It’s a huge bookstore in a former factory – a lot of the old factory signs are still there, and the whole thing is a hodgepodge of creative handmade signs. You can get lost in that place – it’s awesome. You were not kidding. The first one is phenomenal. The second one look kind of like a habitrail. I loved all of these, but especially the first one….how nice that a space once devoted to the propagation of ignorance and superstition has been reconfigured to spread genuine knowledge and enlightenment. One down, how many million to go….? Wow, Dave. What an ignorant comment. 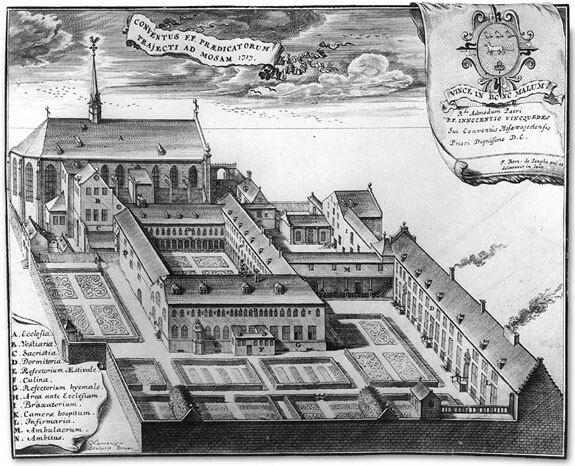 The Catholic Church maintained libraries and supported the sciences for two thousand years. Monks preserved books from Greece and performed science experiments. Gregor Mendel’s work is considered “genuine knowledge”. Your anti-historical rant flies in the face of the facts. Thanks! I think you just created my next “I want to travel to” list. Wonderful collection. Made my day.